Although many of your students may already recognize the benefits of knowing English, some may still be on the fence and question the necessity of what you're trying to teach them. And when bogged down in new words or struggling with grammar, it's more likely they'll begin to wonder if it will all be worth it in the end. Yet there are many reasons millions of people study English every year. Use this list to help motivate your students and remind them why the task they're undertaking is worthwhile. 1. Around 1.5 billion people in the world speak English. With around 7.6 billion people living in the world, 1.5 billion may seem like a small number, but it's still around 1/5 of the population. And given that there are over 6,500 known languages in the world, the fact that 1.5 billion people speak one language is a pretty big deal. The other commonly spoken language is Mandarin, but you're less likely to find people who know Mandarin outside of China whereas you'll find English speakers all over the world. Over 50 countries list English as their official language or the official language of higher instruction. These include countries in Europe, Africa, Central America, North America, and Asia. So if you head to Singapore, Jamaica, Zimbabwe, or New Zealand, you'll likely find people speaking some form of English. 3. Many industries rely on English. Want to work in the tourism industry or explore a career in aviation? You'll need to know English. Diplomatic and scientific communities use English as their official language as well. Knowing English will make it easier to communicate with others in the field, find employment, and understand key terms and reference materials. 4. English is the language of the Internet. Although you may be able to find websites in your own language, many international websites are created primarily in English. This includes forums and discussion boards. It's much easier to find information and communicate with others online if you know one of the most common languages on Earth. 5. Movies, television, and other forms of media love English. Sometimes English speakers watch movies with subtitles, but more often than not, non-English speakers are the ones experiencing blockbuster hits with subtitles in their own language. If you want to watch the latest big movies in America or understand the lyrics to Beyonce's latest hits, it helps to know English. 6. English can help you get a job. In the business world, knowing English is key and many international companies require that higher level employees speak the language. 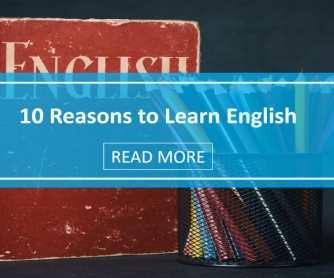 Knowing English could help you get a promotion or get you an in at a better company which may also lead to better pay and benefits. 7. There are a wealth of programs and resources to help. BusyTeacher isn't the only resource out there designed to help people learn English, even if it may be one of the best (we're a bit biased). Because English is so popular, it's easy to find books, videos, tutors, teachers, and even whole schools dedicated to learning the English language. Many of these are available for free too. 8. Learning another language makes you smarter. Studies have shown that people who learn a second language make critical brain connections and improve their overall cognitive ability. It takes a lot of effort to think in more than one language and if you're able to put together the pieces to speak English efficiently, you're doing a great service for your brain. 9. English is actual a fairly simple language. When you're deep in the process, English may seem like the most complicated language on Earth, but compared to many languages, it's actually pretty simple. The language itself is based on a simple 26-letter alphabet and you don't have to remember if words are masculine or feminine. There are fewer accents on letters to change their pronunciation. Of course, there are still idioms and complex construction in sentences that can make things challenging, but at the basic level, it's easier to pick up a beginning knowledge of English than some other languages. 10. Whatever personal reason you have, it's important. learn English and remind them of the items on their lists when they feel like giving up or start to slack off in class.